On more than one occasion I’ve gotten emails from people who use “auto-entrepreneur” and “profession liberale” interchangeably. They aren’t interchangeable – and more importantly for readers of my blog, auto-entrepreneur is not a visa status. It’s a tax classification, and not necessarily a desirable one at that. In 2009 President Nicolas Sarkozy created “auto-entrepreneur” as a simple way for French people (and foreign nationals) to start small businesses. With a ceiling of 32,900 euros per year of topline revenue, it was seen as a liberalizing measure, without committing to full Anglo-Saxon soul destruction. You would pay your social charges “as you go” which meant if you had no sales, there were no charges. If you went two years without earning anything, you would simply automatically lose the classification, with no penalty. This allowed holders of the status to try starting a small business “risk-free” in tax terms, and potentially add on an additional stream of revenue without onerous accounting burdens. The regime is actually now called “micro-entrepreneur” and you are said to be running a “microenterprise” if you use this tax classification. In American terms this is a sole proprietorship, meaning you have unlimited legal liability should problems result. There’s a lot of bad advice on the Internet and so on more than one occasion people have registered for auto-entrepreneur while on Visitor visas, thinking that they had found a legal way to work in France. They didn’t realize the regime that allows you to register and get a SIRET (what Americans know as an EIN – employer identification number) isn’t connected with OFII so they aren’t equipped to validate whether you’re eligible to register. You just have to supply some basic info and then you can get a number. But this has led to tears on more than one occasion when someone showed up to renew their Visitor visa with auto-entrepreneur earnings on their bank statements and a SIRET they shouldn’t have had. Visa renewal denied,; eligibility to live in France ended, and the process of living in France had to begin all over again, back in their home countries. Furthermore, President Emmanuel Macron raised the limit that micro-enterprises could earn to 70,000 euros. But most people don’t know that the minute you go over 33,100 euros, you are subject to VAT (as I outlined here), no matter what your tax classification is. Goodbye simple accounting; hello nightmare exchanges with URSSAF and the Department of Finance. So, if you want to have a business in France, make sure you have the correct visa for it, or that your CDI allows for it. For some foreigners here on a salarie work visa, their contract specifically prohibits their starting a business under the micro-entrepreneur classification. If you’re here as a Visitor, you are ineligible to apply for this classification. I know that there’s nothing on the internet that seems to say this, but it’s just a simple fact: If you don’t have a visa allowing you to work, going to a website and clicking a few buttons isn’t a magical fix. This relates back to something I’ve said before: No one from French immigration ever tells you that as a visitor you have to file taxes in France even though you aren’t paying taxes in France. Remember, in immigration in general and in France in particular, if it seems too good to be true, it is. Always double and triple check before you make a major decision regarding these issues. 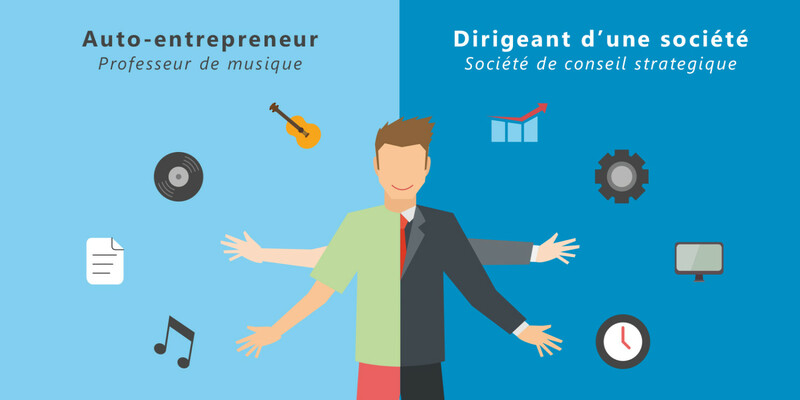 If you want to start a small business in France, profession liberale remains the simplest route, with many options to change it if your business becomes really successful, and zero requirements to register as a micro-entrepreneur at any stage whatsoever. Singaporean-born American Stephen Heiner has been living in Paris since 2013, a what he hopes to be a permanent home after living in Asia and the United States for most of his life. While he has an undergraduate degree in literature, he also has an MBA, and he’s very much the man who enjoys studying financial statements as much as he enjoys reading essays by G.K. Chesterton or James Howard Kuntsler. He visits his family in the US and Singapore each year, but in the meantime enjoys his dream city, which he finally had a chance to move to after selling a company he built over a number of years. You can find him on twitter and instagram @stephenheiner. You can also follow his immigration journey on www.theamericaninparis.com, where Stephen also offers consulting to those interested in relocating to and/or making a life in France.